The first eggplant from the hoophouse is in today’s share (try baba ganoush recipe below!). Also Romano beans were given out last Thursday as well as today. They are an italian heirloom green bean: flatter, longer, and meatier than your typical green bean. Use them as you would a regular green bean or try the saute with tomatoes below. Lots of tomatoes and cucumbers in the share as well today. 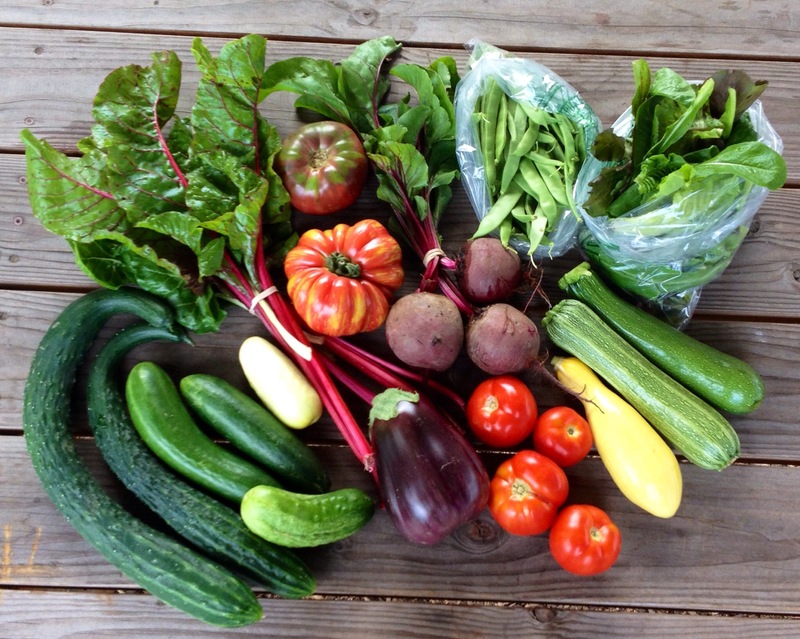 Beets and chard, summer squash/zucchini, and cut mixed lettuce fill out week’s offerings. Remember to use those beet greens with the chard if you want more greens to cook with. Get that lettuce mix in the fridge as fast as you can for best results. Also, the lettuce is not completely dry so I recommend putting a clean cotton cloth in the bag with the lettuce to help soak up some of the moisture on the (or spin them dry in a salad spinner). 3. Arrange on a baking sheet and drizzle with olive oil and a pinch of sea salt. Roast for 5-10 minutes, turning once or twice, until the eggplant is softened and golden brown. Remove from pan, stack and wrap the rounds in foil to lock in moisture – wait 5 minutes. 5. Add lemon juice, garlic, tahini, a pinch of salt and mix until creamy. Add herbs last and pulse to incorporate. Taste and adjust seasonings as needed. 1. Heat olive oil in a 12″ skillet over medium-high heat. Add garlic and cook, stirring often, until soft, about 2 minutes. 2. Add tomatoes and cook, stirring, until broken down and soft. 3. Add green beans and ½ cup water; cover pan with lid and cook, stirring occasionally, until beans are soft, about 8 minutes. 4. Remove from heat; season with kosher salt and freshly ground black pepper.